The augmented reality mobile game Pokemon Go, that has taken the world by a storm ever since its launch on 7 July 2016, has finally been launched in India. Niantic Inc., the developer behind the mobile game along with The Pokemon Company, has partnered with Reliance Jio to bring the game to the country. The game will be available to download via Google Play and the App Store from Wednesday in India, the telecom operator said. The partnership will also result in thousands of Reliance Digital Stores and their select partners in the country to become Pokemon Gyms or PokeStops â€“ a strategic masterstroke by Reliance. "We are delighted to partner with Jio to launch Pokemon GO in India." said John Hanke, chief executive officer and founder of Niantic. "It's exciting to see Pokemon fans in India step out and explore their neighbourhoods in search of Pokemon and Jio's disruptive high speed 4G LTE Network will be an excellent way to experience the game." Under the partnership, Pokemon players will have access to Pokemon Go channel on the Jio's social messaging app, JioChat. The Pokemon Go Channel will enable Pokemon Go players to collaborate and be part of a community of players with daily tips, contests, clues, and special events. The game is available in hundreds of countries but had failed to make it to India. "With over 500 million downloads globally, we are excited to launch Pokemon GO officially in India on the Reliance Jio network," said Mathew Oommen, president, Reliance Jio. "Our partnership with Niantic not only brings access to the Pokemon GO app but also opens the door to more opportunities for our customers to enjoy content on Jio's one-of-a-kind mobile broadband network." The AR game uses geo-locations to place Pokemon across important landmarks and places in cities. A player needs to walk around his/her city to find and catch Pokemon that appear on their screen superimposed on the background of what your camera sees. 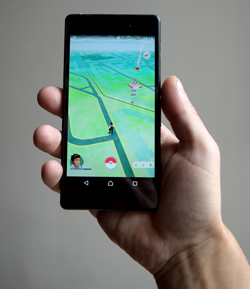 The game requires a smartphone with an active data connection, camera and GPS to run. The partnership gives Reliance Jio connections the potential to up its subscription rates; the company is currently offering promotional free data, voice calling, roaming and more to all users until March 2017. Pokemon Go had beaten both Candy Crush Saga (8.7%) and Clash of Clans (5.2%) on current installs in less than a week after its release in the US.